CD reviews: "Stop and Let the Devil Ride" and "Eight Ball Blues"
These reviews first appeared in the Summer 2003 issue of Turbula. Is the blues where all the really good rock guitar is happening these days? Two new releases point out the interesting phenomenon that what we used to call hard rock is more and more being marketed as the blues. Sure, back in the day, we knew that Savoy Brown and Robin Trower were heavily influenced by the blues, but they were rock artists at heart. Even John Mayall's Bluesbreakers' albums could be found in the rock bin at the record store. Today, it seems like anything with a guitar has to be the blues. The last couple albums by Trower and Mayall are as likely to be found in the blues section as not. 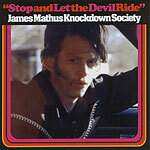 And so it is with the new albums by the James Mathus Knockdown Society and Belgrade's Point Blank Blues Band. Both are full of the thick, swirling, heady kinds of heavy grooves that one used to find on Uriah Heep or Wishbone Ash albums. Mathus gained his early fame as leader of the Squirrel Nut Zippers, a retro swing band. But he seems much more comfortable in a leather bomber's jacket playing the sort of distorted, psychedelic blues one might have heard at the Fillmore in '71. From early ZZ Top to Otis Rush, classic Stones to a young Johnny Winter, Blind Faith to Faces, Mathus manages to pack an entire aural history of guitar-based blues-rock into his playing. And, okay, there are a ton of tribute bands out there  but Mathus ain't in that group. This is his own thing, it's just influenced by the heavy blues more than anything else, much as Government Mule is influenced by the Allman Brothers but isn't a tribute band. For starters, most of the songs here are Mathus originals. And his singing isn't really like anyone else's  well, maybe a bit like James Dewar's (singer for Robin Trower). And the other thing is that Mathus' guitar playing is all his own; sure, he could hold his own with any of the above cats  zap him back in time, and he'd fit right in at Woodstock. But he's also right at home here in 2003. Besides, we need him more now  they were spoiled back then with all those bands. The Point Blank Blues Band is from Serbia, a country that's known a few troubles of its own in its recent halting advances toward democracy. They've been together 20 some years (albeit with the usual rotating cast), and play with the confidence that only that kind of familiarity and experience can bring about. The band's leader, singer and guitarist (and primary songwriter) is known only as Dr. His singing is passable; impassioned but not particularly noteworthy  well, except for the fact that a Serb band is performing songs in English. His guitar playing, however  okay, now that gets your attention. It's a cross between Trower and Kim Simmonds and Dave Hole and Buddy Guy. He's definitely a fan of effects boxes and pedals and whammies  if there's a sound you want pulled out of an electric guitar, Dr. is your man. And the rest of the band are no slouches. Darko Grujić plays a muscular, sweaty organ and piano, sharing many of the leads with Dr., while Zoran Milenković (bass) and Jovan Pejčinović (drums) create a solid  and swinging  rhythm. But you need good songs, no matter how well you play. Point Blank has that, too. "Johnny Passed Away" is an ultra-slow funky, Southern-tinged boogie  the sort of song Atlanta Rhythm Section played at their best. "Blue Ball" is a fast-paced blues rocker a la the Allman Brothers. And on "The Mirror," they get into a Lou Reedish blues dirge  reminds a bit of "Sweet Jane." Point Blank Blues Band does dip into more straight-ahead blues than any of the hard-rock bands listed above. "A Cross to Bear" is a strict piece of Chicago Blues  Otis Rush could play this song and you'd never guess it was born in the Balkans. "You Are a Natural," "It's All Right" and "You Play" are all similarly straight blues that would sound perfectly at home in the hands of an Eddie Kirkland or Sam Lay Blues Band or any other American outfit you want to name. None of the above comparisons are meant to suggest that Point Blank Blues Band simply sounds like any of the other bands held out for reference. These guys have their own sound, their own groove. It's just so full of different influences that it's near impossible to try to describe it without referring back to them. You listen to this CD, and even if you've never been to Belgrade (like your loyal reviewer), you just know that the Serbs must have the kind of beer- and whiskey-soaked dive bars that provide support and sustenance for stateside blues and rock bands. The music on "Eight Ball Blues" wasn't created in any sterile confines, but in a real-world blue-collar environment of some sort. And it offers more proof that the blues is no longer strictly an American creation nor art form. It may have been birthed here  but anyone who can play like this is every bit as legit and authentic a bluesman as someone born and raised in the Delta.